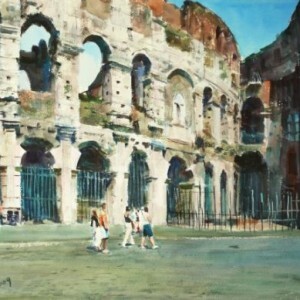 Since 1956, a large number of paintings have been shown and won awards in national exhibitions. 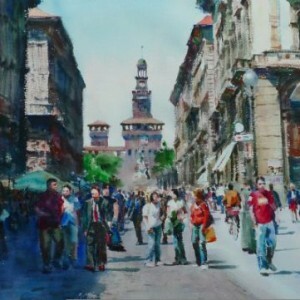 Many works have also been exhibited and well received in various international art shows, including exhibitions held in Taiwan, Singapore, Japan, United States, and France. Works have been regularly published by renowned publishing house within China. Both Shanghai TV and Hong Kong ATV have produced prime-time programs titled ‘Watercolourist Xidan Chen’. In August 2007, invited by Hong Kong Central-West District Government, Xidan participated in ‘Watercolour Exhibition – Celebrating the 10th anniversary of the establishment of the Hong Kong Special Administrative Region’. 2009 – 2010 Initiated and planned the Shanghai Zhujiajiao International Watercolour Biennial Exhibition. February – March 2010 Exhibited in the Australian Watercolour Institute Annual Exhibition, held at Gosford Regional Art Gallery. 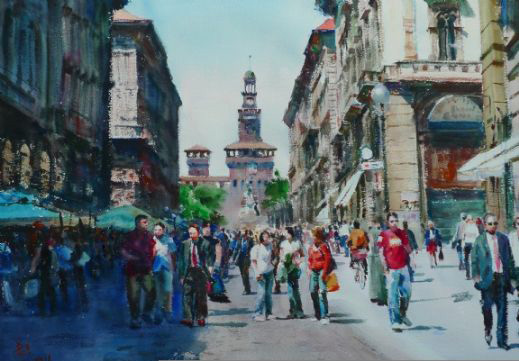 April 2010, works exhibited in China Master’s Invitation Exhibition held by Baiyaxuan Gallery Shanghai. 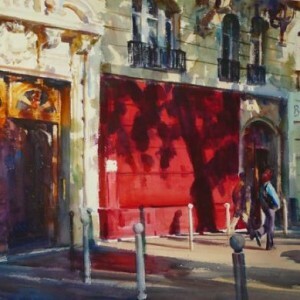 December 2010 – January 2011 Exhibited in the Australian Watercolour Institute Annual Exhibition, held at Mosman Art Gallery Sydney. 20th March – 20th April 2011 Exhibit in Shenzhen Watercolour Artists Invitation Exhibition, held at Quanhua Watercolour Art Gallery Shanghai. 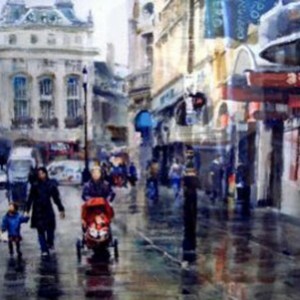 30th March – 10th April 2011 Work ‘Milan’ exhibit at the Royal Institute for Painters in Watercolour Annual Exhibition, held at the Mall Galleries London. 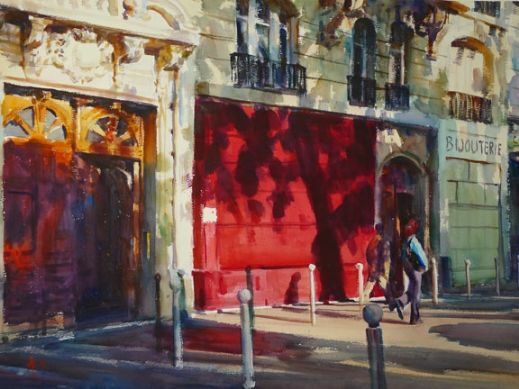 22nd October – 3rd December 2011 Work ‘Red Door’ exhibit at the National Watercolor Society 91st Annual Exhibition, held at NWS Gallery 915 South Pacific Ave., San Pedro, California, USA. 22nd October 2011 Work ‘Red Door” was awarded JJC Industries Wholesaler of Daniel Smith Manufactured Products Award. 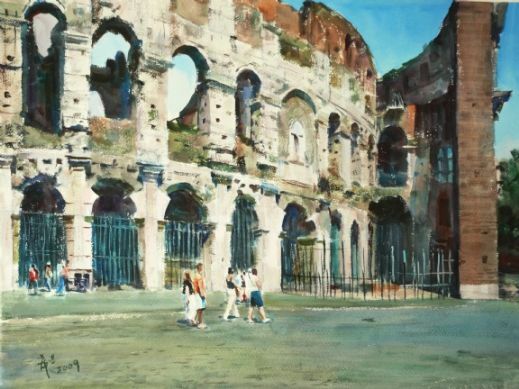 December 2011 – January 2012 Works ‘Roman Colisseum’ and ‘London Street’ exhibited in the Australian Watercolour Institute Annual Exhibition, held at Gosford Regional Gallery. 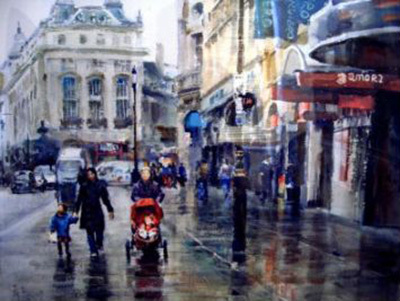 March 2012 – Work ‘Victoria & Albert Museum’ exhibited in the 200th Royal Institute of Painters in Watercolour Annual Exhibition, held at the Mall Galleries, London.